Bid and Contract Submittals — for General Construction, USACE-NAVFAC, DOE, FTA-DOT, FHWA, ISO 9001 or ISNetworld compliance. USACE-Navfac EM 385-1-1 Accident Prevention Plan and/or OSHA Safety & Health Plan contract submittals. 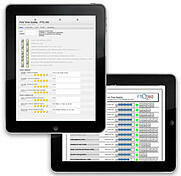 Mobile/web-based system for inspecting and managing project quality & subcontractor and supplier performance. EPP and EMP, Good for both Military (USACE) and Non-Military Construction Projects.